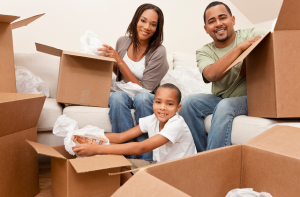 Make moving long distance easier on your family by planning ahead. Take care of the specifics, in order to have extra time to deal with the emotions of such a big life change. Prepare as much as possible to reduce your stress level, as well as any discomfort your loved ones may be feeling. Do not wait until the last minute to pack up your existing house. This will just cause your entire family to be overwhelmed. Instead, pack up the belongings you do not need and look into local storage units to keep them safe and secure until you are ready to load them and move them to your new home. This allows you to spend additional time with the loved ones you are moving away from before you go, rather than scrambling to get things together. Show your kids pictures of your new house to have them start planning how they are going to decorate their rooms. If you do not have a home purchased where you are relocating to, look up attractions around the city. Plan a few family days, before you get there, to give them something to look forward to in their new neighborhood. Keep out important things to ride along with you, rather than packing them away. For example, give each child a box to pack special items in they can immediately have access to when you reach your destination. If possible, have a few favorite items moved ahead of time, such as family photos or other mementos. Then, when you reach your new place, you can hang the items up to make the place instantly feel like home. If you already have a residence in your new location, whether it is temporary or permanent, set up services before you get there. Have your internet and TV services installed, so your family can settle back into a routine, as soon as possible. The less you have to deal with immediately before the move and immediately afterward allows you to concentrate on how you’re family is feeling about and dealing with the change. The more undivided attention they have from you, the easier it will be for them to adjust. Take the time to put all your ducks in a row, before you start the journey, to make moving long distance easier on your family. This way, you have the time to take care of your little ducklings during the migration to your new home.